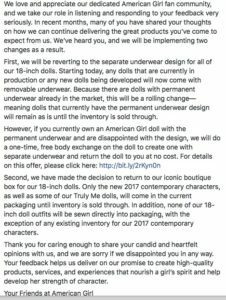 American Girl announced on Facebook yesterday, that they are getting rid of permapanties, reverting back to their original boxes and clothes are no longer going to be sewn to the box. Yay! The update they posted is pictured below. If you have any questions or comments please leave them below. Also if you want to find the post, it is on their Facebook page. Thank you! So happy about this! The power of complaints A says hi, and guess what? Haha…I might design my own website! Wouldn’t that be cool? That would be super cool! I would be your first subscriber. Whew, am I glad AG got rid of the permapanties and the boxes. What were your thoughts on them? For me, I really didn’t want the new boxes, because the old ones made it seem like you were getting something so special. Hello Sara! Im really glad AG got rid of them as well! I did not like the new boxes, in my opinion they were really fragile and easily ripped. I am good, how are you?